I didn’t have photos the last time I talked about the garden, but now I do. So here, first off, is the genius door in my garden. On the left is a pink jasmine, which blooms once a year, briefly. On the right is a star jasmine, which pretty much blooms in spring and all summer. Tom's genius idea in place. Gorgeous! Right behind the gate, on the other side, is the beginning of my basil dynasty. On the left, sweet basil. In the middle, Thai basil. And on the right (which you can’t see in this photo) varigated perennial basil. I’ll believe it when I see it – the perennial part, I mean. 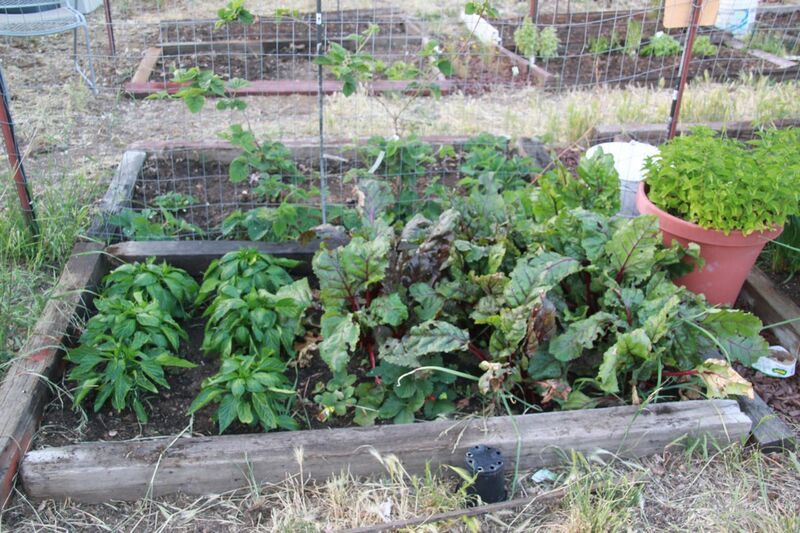 Here’s my beets and bell peppers bed. 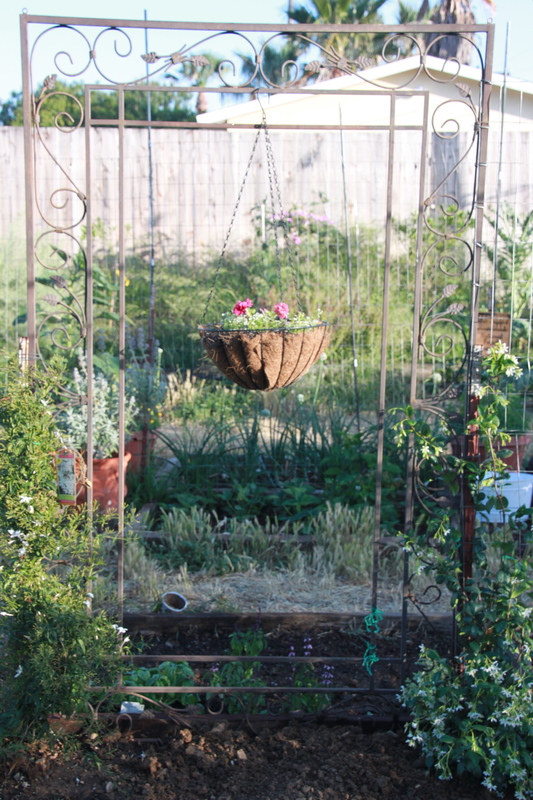 To the right is a pot of mint; in the bed behind this one is a blackberry (marion) climbing up the wire fencing, and strawberries planted in front of it. The next photo is taken from an extreme corner of my back yard, trying to get as much of the scope of the garden as possible. To the left is one of the Meyer lemon trees. Straight in front are four small artichoke plants and three bigger ones. Moving to the right is a Bearss Lime tree – and beyond that, more artichokes. (The gate gets lost in this photo.) The beet and bell pepper bed, shown above, is to the right of the trash can. Behind me is another lemon tree and some squash seedlings. Onion bed, with bee balm (small) in each front corner. Mint is to the left, Johnny Jump Ups and Buddha to the right, more strawberries and a boysenberry behind, with white sage in the pot behind the pot with the Johnny Jump Ups. 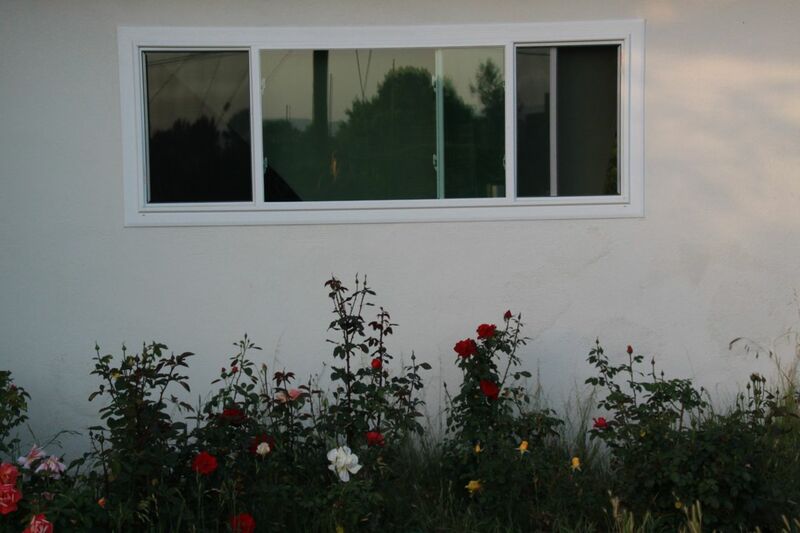 and…the rose garden, tamed through Tom’s diligent weeding work. 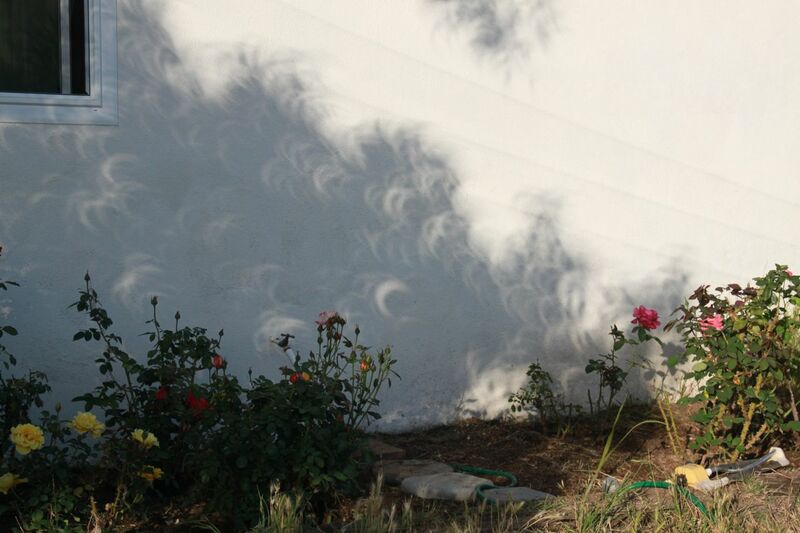 With some brilliant shadows on the wall, thanks to the annular eclipse today. Hope you enjoyed the trip through the garden. Thanks for stopping by. I’ll post more as things develop! DEMON SOUL is out now…BLOOD DREAMS, a Caine Brothers Short Story available June 1st. DEMON HUNT coming this summer! This entry was posted in Life, Observations and tagged artichokes, basil, bee balm, beets, bell peppers, Blood Dreams, Christine Ashworth, Crescent Moon Press, Demon Hunt, demon soul, garden, onions, roses. Bookmark the permalink. Christine, I’m so envious of your garden. I so want to make a small garden happen here as we are 35 miles from the nearest grocery store! My physical limitations have held me back a bit, so I’m looking for someone to help. Maybe I will use your pictures as a guideline. It is just beautiful. Tonight as we were out on the patio “watching” the eclipse, there was the most beautiful pattern of shadows on the wall of our house with the sun shinging through the sycamore tree. And the shadows on the wall of your house were exactly the same. At first I didn’t realize that all those crescent shapes were actually the eclipsed sun. Really quite wonderful. Thanks for sharing your beautiful garden. Oh, to have artichokes in the back yard! Heaven! Much love, dear. Nancy! I’m all for raised beds, but all we do is put used fencing around ours. 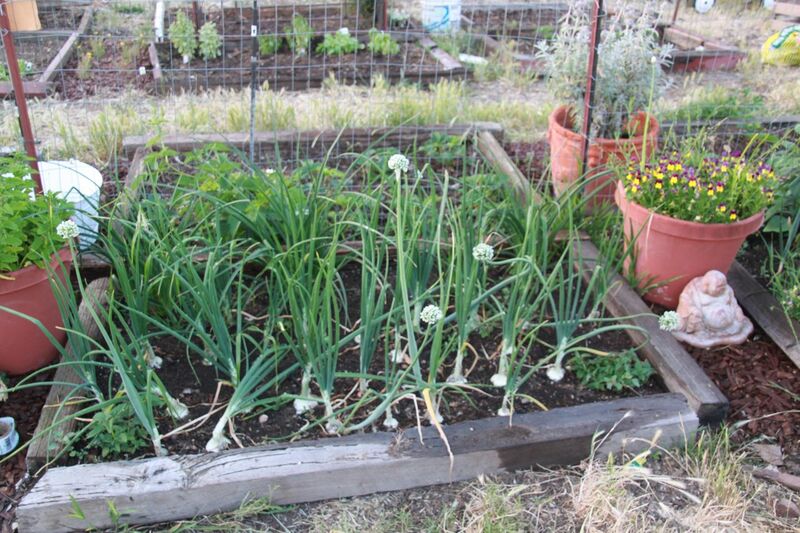 Someday, raised beds…so I don’t have to kneel down. That’s my dream. I adore your garden. I’m green with envy. My grandmother had a farm and was a huge gardener. She had a paper sign that went like this: The kiss of the sun for pardon, the song of the birds for mirth, we’re nearer God’s heart in a garden than anywhere else on earth. I found the saying on a wrought iron plaque and of course it now has a prime position in my small garden. And I think it’s so true. I find such peace and healing in the garden. I love that saying, Roben – my mom had something like that over her desk. My dad is still the gardener -next time I go down, I’ll take photos – his tomato plants get to be at least six feet tall and about four feet wide. He’s amazing! 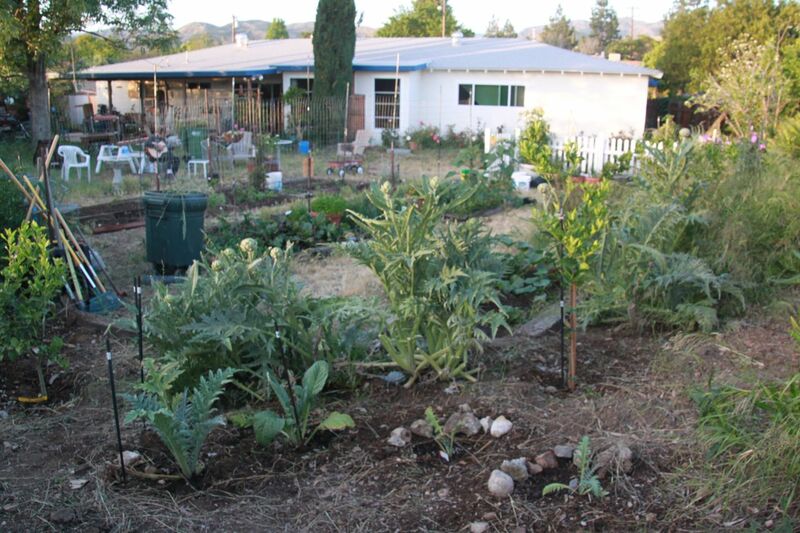 My house may be a mess…but my garden is getting there. OH MY GOD! What a wonderful, beautiful garden!!! This is the biggest its ever been, Carol. It’s been too long since you’ve been over! Hugs, honey! Just makes my breathing slow and my heart rate adjust to “zoned” as each new picture appears. Simply lovely. What a wonderful garden. And you were brilliant to put your mint in a pot. I put one tiny plant in the corner of one bed a couple of years ago, and we can’t get it to stop taking over the entire space. My poor rosemary shares the bed, and seems to shrink every year. But this bed is located right outside my customary exit door for the house, so the fragrance of the two whenever I go in or out is worth the effort. And my cat loves napping in the middle of the mint. Still, nothing like yours. All your hard work shows–but what a fabulous way to spend your time. So envious. Well – truth time! Most of the heavy work has been done by Tom and my boys – I just get to spade in the soil amendment and the manure, and then plant. My favorite part! Though weed pulling can give a terrific workout, I will admit. So glad you got a picture of the shadows produced by the eclipse. I took a few with my camera, but don’t know how to upload them to my computer, so I was delighted that you posted one. Thanks! Yeah – I finally got my act together to figure out how to put photos into my blog from my camera. Took me awhile – but since I’d finished edits yesterday, I had some time.